Home » Website Building » SEO » What is Excluded Pages Option in Yandex Webmaster Tools? What is Excluded Pages Option in Yandex Webmaster Tools? This article explains how to use this tool step by step. In order to use this tool you must have added and verified your site in Yandex Webmaster Tools. Login to your account and select the site you want to analyze. Go to “Excluded Pages” option available under “Indexing” section. Yandex will show the pages from your site that were not indexed by YandexBot under various categories. All the pages received HTTP errors during crawling will be shown here along with the error code. For example “Page Not Found” pages will be shown with the error code 404. URLs blocked by robots.txt file are shown under this category. Page formats which are not supported by YandexBot are shown here. XML files including your Sitemap will be showing here as invalid file format and you do not any action for XML files showing in this category. YandexBot will not know whether the page is intentionally blocked by the site owner or just getting error only at that moment. Hence, Yandex provides an option to set the level of importance on indexing for each error codes. You can click on the “Settings” link shown in the above picture to access the error code page. 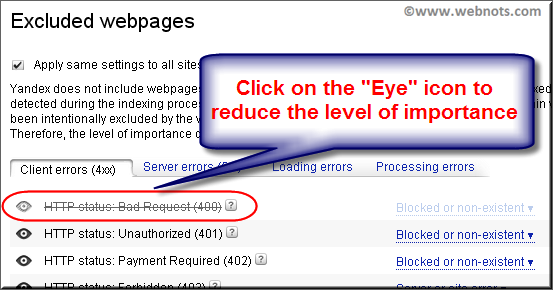 Click on the “eye” icon to reduce the importance of any error code. The option can also be accessed through “Settings” tab of your Webmaster Tools account. The general error in the HTTP status section is “Page Not Found” error with 404 status code. 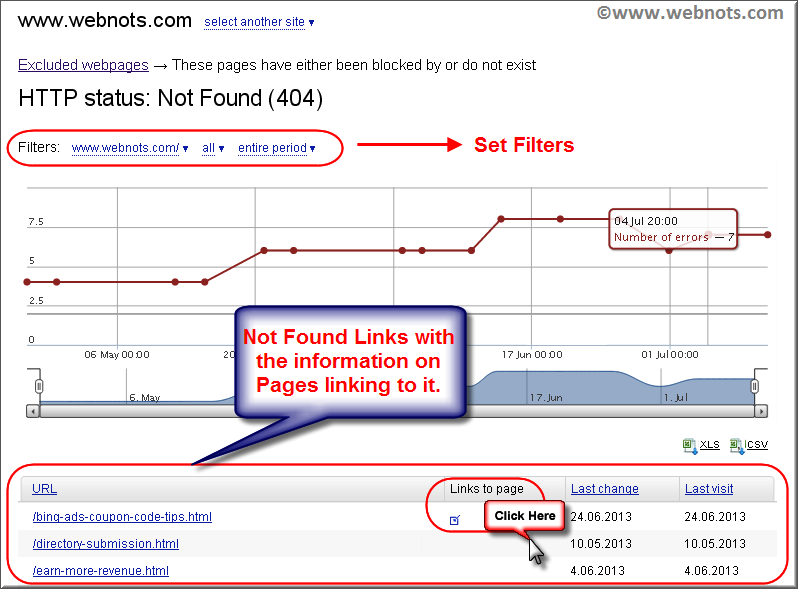 Click on the link to see detailed list of URLs received 404 error code during crawling of YandexBot. You can see the graphical representation as well as each individual URLs with 404 error along with the last crawl date. 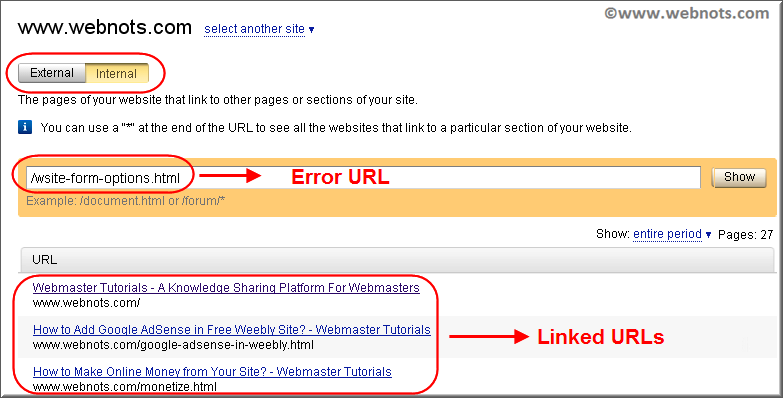 “Links to page” column will show the internal or external pages linking to the error page if applicable. Click on the box icon shown under the links to page column to see all the links connecting to the error URL. If you want to troubleshoot the excluded pages you need to understand the response received by YandexBot during crawling. Yandex offers a tool called “Server Response Check” to help webmasters to fetch the pages as YandexBot and check the response received. Click here to learn more about server response check.